***The Margaret W. & Joseph L. Fisher Art Gallery at the Rachel M. Schlesinger Concert Hall and Arts Center is currently displaying “Memory, Mostly Self” by regional artist Wayson R. Jones. His work will be on display through July 30. In an effort to give more insight into Jones’ work and why he was compelled to create these pieces, the Schlesinger Center spoke with him about his artistic process. Schlesinger: Was there a particular experience that inspired you to pursue visual art (given your background in music and performance)? WRJ: Yes, actually. When I lived on Capitol Hill, I did something I’d been thinking about for a while – making collages with the autumn-color leaves. So I was going to Michael’s craft store buying light box-type frames for them. Of course the collages turned brown in a couple of months, but by then I’d bought a few oil pastels, just out of curiosity. I’d done visual pieces since I was in my 20s, one every 4 or 5 years or so, so it wasn’t completely new. Once I started with chalk pastels, I started really getting into it and showing my work. Artomatic 2008 was the first time, and it’s just gone on from there. Schlesinger: What are your artistic inspirations? WRJ: Most of it comes from my immediate environment, mostly the sky and the street. Clouds, stars, frozen salty winter streets, stained sidewalks, roadkill. As far as fine art, abstract expressionism, particularly Joan Mitchell, Mark Rothko, Robert Motherwell, Jean Dubuffet. Artists who are really invested in materiality, like Sam Gilliam, Lynda Benglis, Chakaia Booker. Those who work at large scale, like Martin Puryear, Leonardo Drew. Schlesinger: The surfaces of your paintings are very textured and multi-layered. What can you tell us about your creative process? WRJ: It’s intuitive, with no preliminary sketches. I’ll start with just knowing what sort of piece I’m going to do, as in this figurative series. 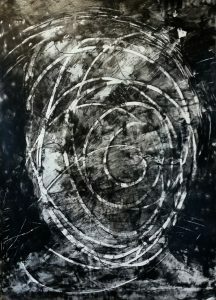 Most of the pieces in this show (e.g., Swirling, Beautiful Flower, Judger) are done by pouring acrylic gloss medium on the surface, using it to draw the figure and gestural marks, then sprinkling powdered graphite and working it with a palette knife. The acrylic creates a resist that leaves the drawn lines more or less the white of the paper. The uneven blending of the materials gives the illusory depth. I like that the result of a fairly simple process can be visually textured and complex. Schlesinger: When people look at your work, what do you hope they get from it? What kind of reaction were you going for when creating this body of work, and what kind of conversation do you hope it provokes? WRJ: I want them to feel a sense of presence, a feeling of energy directed toward them from the figure. I don’t consider that I’m teaching, but creating an experience for the viewer. The main reaction I want is for people to not just look at but to see the work. I guess I don’t have goals in terms of reaction or conversation. That there’s reaction to and conversation about the work is a good thing in itself; remarks are almost always interesting and sometimes illuminating. Schlesinger; Compared to your other work, how are the paintings in Memory, Mostly Self different? WRJ: Mainly in that they’re among the most intentionally figurative pieces I’ve done. But the techniques and materials are the same as my more abstract stuff. Schlesinger: A lot of artists say that a piece is never really complete. If anything, what would you change or do differently about this body of work? WRJ: I find almost the opposite. There’s a pretty defined point at which the piece lets me know it’s done, and going beyond that is nearly always a mistake. I wouldn’t change anything about these particular pieces; I’m very pleased with them overall. If I go back into a piece, it’s usually to completely rework or paint over it. You can find so much history and culture that inspired the black community over the decades in the pages of Jet and Ebony. Why were the male images from these magazines important to include in your creative process for this show? What role did those magazines play in your childhood? WRJ: The identification with the Ebony/Jet images was a post-hoc thing, coming after the pieces were finished. It’s what resonated for me when I looked at the images. So I wouldn’t really say they were included in the creative process, more so the titling and what the images suggested. Several of the pieces are self-portraits based on an old family snapshot, when I was around 6 or 7. I think the tie-in with the magazines is very much about memory of those times more so than their cultural significance, which I didn’t really understand as a kid. What can viewers and art lovers expect from your work in the future? WRJ: If this series continues, it will probably go bigger and on different surfaces: canvas, wood or aluminum maybe. I’ve also started a series of collages that were inspired in part by this figurative work. I’m using laser prints of the same childhood photo in some of them. 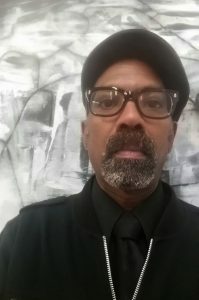 Wayson R. Jones’ “Memory, Mostly Self” will be on display in the Fisher Gallery through July 30 with an artist’s reception 2 p.m. to 4 p.m. Saturday, July 8. Read another Wayson Q&A with East City Art here.